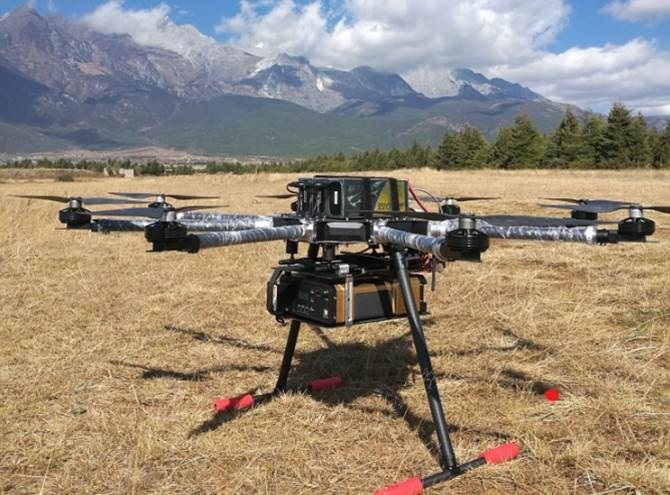 A SPECTRAL EVOLUTION distributor in China, Azup International Group, Ltd., worked with Beijing Anzhou Technology Co. Ltd on attaching a PSR+ field spectroradiometer to an eight rotor UAV for measuring ground cover across three fields as a test of measurement and stability. Field route coverage of about 800 meters by 200 meters. Weather was sunny. Flight parameters included 30 meter altitude with a field of view angle of 25 degrees, flight interval of 50 meters with an equidistant triggering distance of 50 meters. Scans triggered by flight control system for measurement—isometric trigger set to 50 meters. Lashi Hainan region with thin cloud coverage for weather. Flight parameters included altitude of 20 meters, field of view angle of 25 degrees, flight interval 20 meters, equidistant triggering distance of 30 meters. Scans triggered by flight control system, set with a 30 meter equidistant trigger. Tai’an potato base—bare field. Stable light with a cloud around the sun. Flight parameters included altitude of 30 meters, field of view angle of 25 degrees, flight interval of 20 meters, equidistant triggering of 30 meters. Scans triggered by flight control system, set with a 30 meter equidistant trigger. 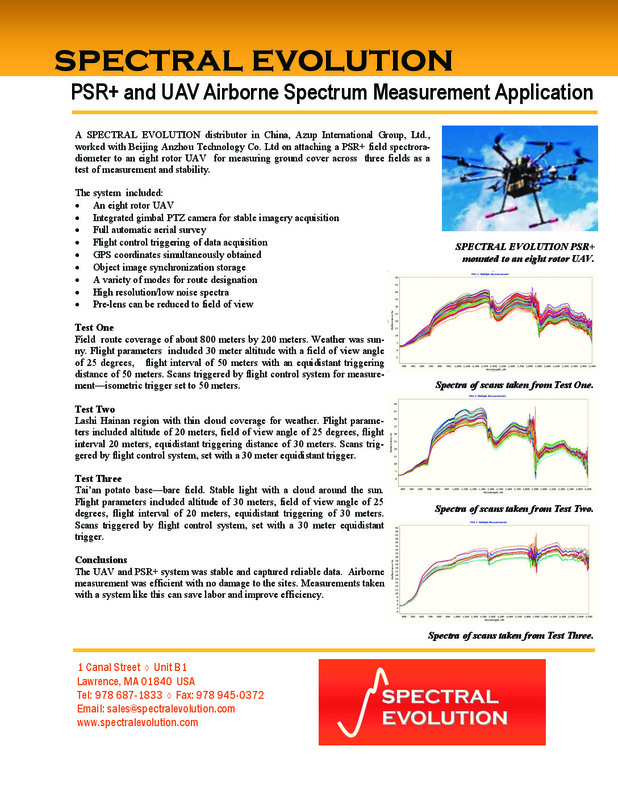 The UAV and PSR+ system was stable and captured reliable data. Airborne measurement was efficient with no damage to the sites. Measurements taken with a system like this can save labor and improve efficiency. The PSR+ mounted on an eight rotor UAV for vegetation scans.